The link between Italy and England doesn’t stop here as we are talking about Anna Calvi. Italian name, Italian descent, 100% English. 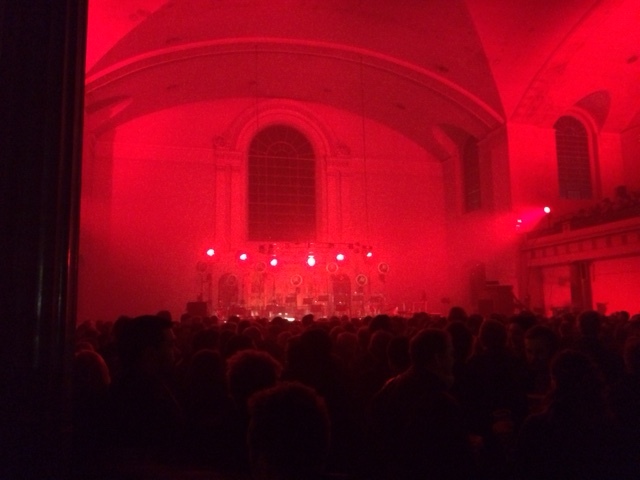 As it is to arrange a gig in a Church – well…Rome excluded. It is a special occasion for Anna, as you see the stage ready to guest 30 musicians – The Heritage Orchestra. They enter the room but it is when we could see the gentle, tiny, elegant silhouette of her that the crowd stands still, suddenly. It’s about passion, determination and catharsis. Something that she can offer and reveal with no effort while she sings masterpieces such as Sing To Me, Desire, Rider to the Sea, Suzanne and I. But the presents she prepared for the crowd are more than this: Charlie Fink from Noah and The Whale comes in the room to sing along a Keren Ann piéce Strange Weather; then it’s the time for Patrick Wolf to join for A Kiss To Your Twin. The set goes ahead with a couple of cover from Bruce Springsteen (Fire) and David Bowie (Lady Grinning Soul), both executed flawlessly. Anyway the best is yet to come. Eliza comes to finish off the show and it is a pleasure to the soul. December is a great time for changing, a great time to leave and start again. Whatever you decide to do, just do it with passion. Just like Anna would. Questo articolo è stato pubblicato in 2014, Live e contrassegnato come 2014, Anna Calvi, Bruce Springsteen, Charlie Fink, Clerkenwell, David Bowie, English, Hackney Downs, Italian, Keren Ann, Live, London, Noah and The Whale, Patrick Wolf, Review, St.John in Hackney, Terroni, The Heritage Orchestra da tristeisr . Aggiungi il permalink ai segnalibri.